In the Beatitudes, Jesus says of the meek, “they will inherit the earth.” Meekness, John Dear argues, is the biblical word for nonviolence. He makes the connection Jesus makes at the start of his Sermon on the Mount between our practice of nonviolence and our unity with creation: our rejection of nonviolence is inevitably linked to the catastrophic effects of climate change and environmental ruin. 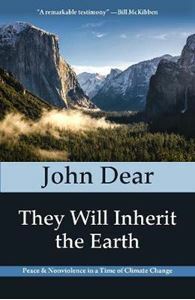 Drawing on personal stories of his life in the desert of New Mexico, his time as a chaplain at Yosemite, his friendship with indigenous and environmental leaders, his experience at the Standing Rock protests, as well as his work with the Vatican on a new stance on nonviolence, John Dear invites us to return to nonviolence as a way of life and a living solidarity with Mother Earth and her creatures. Archbishop Justin Welby sets out to identify the values that will enable us to reimagine, and to enact, a more hopeful future.